I am crazy. I just want to lay that down before I tell you my plans this semester. I am broadcasting my office hours live every Wednesday afternoon this semester. This semester I have over 400 students and I have to do something to try and make myself more available. Each week, during face-to-face office hours I only interact with 0 to 5 students. My hope is that I can raise this number substantially by making it dead simple to start a dialogue with me. I will be using a Google+ feature called Hangouts on Air. Hangouts allow up to 10 people to video conference (in a manner very similar to Skype). Hangouts on Air broadcast the video conference live online and after the broadcast the video is available for students to watch on YouTube. The amazing part of Hangouts on Air is how simple it is to pull off. The recoding, broadcasting, and archiving on YouTube all happens automatically; you just click one check box. If you’ve ever Skyped with someone, you have almost all the skills you’d need to broadcast your office hours. I promise you, if this becomes a pain to manage, I’ll be right back here to tell you about it. Students will be able to “hangout” during the recording (i.e. appear on air with me) using their Google+ accounts. Georgia Southern University, where I teach, provides all students and faculty with Gmail accounts which come with Google+ accounts built in. For students who are camera shy, they can send their questions by email, tweet, or instant message. I’ve created a handout for my students that explains how this whole thing works and how they can get their questions answered. You can download it and adapt it to your class. I am not the first to try this. John Boyer aka the Plaid Avenger at Virginia Tech has been holding online office hours for his mega-classes of 2,670 students. Boyer’s approach is far more animated and humorous than mine, but if you are thinking about holding online office hours, watching a little of his work might help you. I studied his Ustream feed to pick up on the mechanics of broadcasting, receiving real time questions, etc. Wednesday 1:30 EST You Can Watch Live. I am crazy for doing this. Not for hosting online office hours; that will become far more common on a long enough timeline. I am crazy for broadcasting my first live office hours right here in front of all of you. Check back on Wednesday at 1:30EST and you can watch the live stream on this very page. It will be embedded below and we’ll do it live. I’m sick did I miss anything important? TextExpander (or it’s Windows doppelgänger Breezy) is a little program that allows you to write blurbs of text that will automagically plop into anything you write when you type a predefined string of text. TextExpander is always watching what you type just waiting for one of these strings. This is super handy for pieces of text you write all the time. So for instance, I’m always typing the name of my university. So I’ve got it set up so that when I type ggsu it replaces these four letters with Georgia Southern University. TextExpander speeds up all of my emails because I script all of my salutations. To make it easy to remember I repeat a letter 3 times and use t for a generic thanks, p for professional sign offs, and f for a friendly goodbye. TextExpander can be purchased here and it’s PC equivalent can be purchased here. If you use both a PC and a Mac, it’s easy to synch the two up using Dropbox. Finally, if you have an iPhone or iPad TextExpander is available on both platforms. If you’re institution uses Gmail as it’s email client, they love you. Almost all other email clients are absolutely awful for anyone who gets more than 5 emails a day. One of the best things about Gmail is the Labs feature where you can elect to turn on added functionality to your Gmail account. One of my favorites is a feature called Canned Emails that allows you to write boiler plate blocks of text, save them, and then plop them into an email from a drop down menu. It’s super slick. Always be on the lookout for interactions that can be boiler platted. If you find yourself writing something more than once, try using Canned Emails and/or TextExpander. Remember, every moment you spend on interactions that don’t increase human connection, is an opportunity lost. Perhaps no single student question creates more logistical nightmares than “I can’t make your office hours, is there a time when we can meet?” But fret not my friends, I have a foolproof system to make this a snap. Never schedule a student meeting verbally. Students love to ask you to schedule them in as you are setting up for class, as you are tearing down after, or when they see you somewhere on campus. DON’T DO IT! It’s too easy to double book or forget to write it in your calendar later. Asking your students to be responsible for formally requesting the meeting via email unburdens your memory and provides a paper trail that can help both of you be accountable. “Give me 5 half hour windows during the next few days that are convenient for you to meet with me and I’ll pick the first one I can make.” This simple request puts the onus for scheduling the meeting on your student. It also changes an ambiguous question, “when can you meet,” into a focused simple and concrete one. That’s all there is to it. Easy to implement & easy to remember. I love meeting with students. I used to hate it because scheduling meetings and keeping them was a giant bag of stress. With my simple 2 step system it’s easy to make and keep meetings stress free. That last sentence sounds like an infomercial, but I genuinely mean it. I have split up my Intro to Sociology class this fall3 into seven thematic modules. Each module has two online quizzes that students take so they can get immediate feedback and find out early if they are struggling to understand the material. Motivated students who want to learn sociology in a more hands on way can opt to complete a “Doing Sociology Activity”. If students complete the Doing Sociology activity they only need to complete one of the two module quizzes. Students can take the traditional track (2 quizzes) or jump on the experiential track (1 quiz + Doing Sociology activity). Agreed. If you had students sign up for a track, that would be a pain to keep track of and violate rule #1. So to side step this problem, students don’t sign up; they simply turn in the Doing Sociology activity on the day its due. If students don’t turn in the Doing Sociology activity then they need only take both module quizzes. Indeed. So no late Doing Sociology activities are accepted. I write in my syllabus and tell my students that late Doing Sociology activities will not be accepted for any reason. The Doing Sociology Activities are due 3 days before the module quizzes are. If students miss the deadline or decide at anytime they no longer want to complete the activity all they need do is take the second module quiz. It’s simple: Doing Sociology activities are due on Friday, if you don’t turn one in you have to take both module quizzes by the following Monday. No late work, nothing to keep track of, nada. It’s simple: Doing Sociology activities are due on Friday, if you don’t turn the Doing Sociology activity in you have to complete both module quizzes by the following Monday. First, let’s keep this in scope. This is an optional track which means only the most motivated students who are on top of things will participate. This is designed to have the best students self-select into the track. If more than 10% of my class did any of these activities I’d be floored. Now on to the grading. Educators frequently fall into the assumption that the only way to assess student learning is by reading their answers to questions. I spent the summer coming up with activities that asked students to make something that I could grade simply by looking at it or quickly scanning it. The first activity has students develop a survey to find out why their peers don’t complete their assigned class reading. I have them use Google Docs to make the project easy to carry out and a snap to grade. All of the other Doing Sociology activities will ask students to do something that is either visual, tangible, or if it asks them to write something it will be kept under 140 characters. Their completed works will be a synch to grade so even if the entire class does it you’ll be able to grade it quickly. I do. I’ll be publishing them with each Class Pack 2.0 module. So check ‘em out. Enjoy and tell your friends. Why having your students “do sociology” is awesome. When your students do sociology they learn that it is more than facts and concepts in a text book. They can experience the process of sociology and learn firsthand that it is a methodology and an applied science. Because the finished work is highly visual and quickly consumed, it will be very easy to pull excellent student work into your class lecture. Students love seeing themselves and even their peers on stage. This will give them the opportunity to do great work and then bask in the spotlight. 1. I know, I know. “Doing Sociology? That’s the buzziest of buzz words in sociology.” I hear you. Don’t worry, I’m not going to start throwing around “teachable moments”, “lecture launchers”, or any other flimsy catch phrases on SociologySource. I couldn’t come up with a better name, so this once, I ask for a cliché affordance. Thank you in advance. 2. To be clear, I am excited about this opportunity. While many folks focus on what a large class can’t do, I’ll be spending this semester doing things that you can ONLY do with a class this large. I want to turn this limitation into an opportunity and then share with you here how I did it. So stay tuned to SociologySource.com this semester to hear about my experiences. 3. Check out the Class Pack 2.0 to download all the resources I use in teaching my Intro to Sociology classes. Wouldn’t it be great if you could have a roster of all your students names and photos. Something you could turn to as your handing back papers; avoiding that awkward moment were you show your students you don’t know their names. Wouldn’t it be great if after a conversation with a student you could look and see what their name is, what their major is, etc. I am sure that many of your institutions have some form of this, but I have never found one that had all of the things I wanted. Luckily for us we live in the age of Google Docs. Using the “form” functionality in Google Docs you can create online surveys that will collect data and save it to a spreadsheet. I have set up what I call the “student info sheet” to collect pertinent student information at the beginning of each semester. What’s great about this is you can send the survey in an email to your students and then they can fill it out and submit it without ever leaving their email client. Alternatively, you can just email them the link or you can embed it on any webpage, like Blackboard. I’ve embedded an example survey at the end of this post. Feel free to try it out. Also, you can download the text of the survey here. As nice as it is to have all this information about your students it would sure be a whole lot better if there were some photos attached to it. To handle this I have my students email me a photo of themselves with the subject line reading “Photo of _______ ________”. Then I can just search for their name and find the photo I am looking for. If you are worried about email file sizes, you can have your students send the pics to the gmail account you created when you signed up for google docs. There is gigabytes of space to burn with this email service. But how do we connect the photos with the spreadsheet? Well you have two options 1) you can download the Google Doc spreadsheet of your survey results into Microsoft Excel and then just paste each photo into the appropriate row or 2) you can use a database program. I use a Mac computer and the best database program I’ve found on this platform is Bento. Bento is a dead simple drag and drop database for people, like me, who hate fiddling around with complicated database programs. It is $49, but it synchs with my iPhone and iPad. What I love about Bento is that I can have my photo databases wherever I am as long as I have my phone handy. While I like Bento, there are many database options that for the PC and Mac that are both cheaper and a lot more expensive. Pick the database that works for you. Beyond the usefulness of the photos, the database has really helped me understand my students. Somehow knowing a students major, or the way they learn best helps me empathize with them. There is a tendency to assume that the reason someone is acting a certain way in your class is because either they hate you, your class, or the subject. However, there is usually another reason for their behavior and I’ve found students will share this reason with you if you ask. Who is your powerpoint presentation created for? That is, who benefits most from what you put on the slides? Do you put everything a student would need to know to do well on exams? Probably not. When you know a topic like the back of your hand do you put a whole lot of fine details on your slides? Most people don’t. Then who are bullet point slides designed for? Not our students/audience, but for you the presenter. It’s no wonder then that students eyes glaze over by the second slide. Bullet point slides ask your students to listen to you, read what they see, and write it down in their notebook. Listen, read, write simultaneously. But the truth is, no one can really multitask, you can only do 3 things half heartedly. You know what I am talking about; the classroom gets silent when you progress your slides forward. If you want to ask a question you have to wait until everyone gets the slide copied in their notes. Bullet points force your students to ignore you. So then are your presentation slides an aide to your instruction or are you an aide to your PowerPoint’s instruction. You can reclaim your class, if you want to. This slides doesn’t tell your class about the two students who spread cotton in front of the Black Culture Center at the University of Missouri, it takes them there. It shows them the smug look on the perpetrators face when they were arrested. Social Stratification as explained through rock stratification. This photo shows the grieving mother of a Muslim American Solider Kareem Rashad Sultan Khan who was killed in Iraq serving his country. I use this photo when we talk about Islamophobia and what it means to be an American. I tell my students all the time, “If you want a different type of class, then you have to be a different type of student. I promise you that I will do everything in my power to be a different kind of teacher and make this a different kind of classroom experience.” Different in, different out. If you want a different experience with your students you have to try different things. 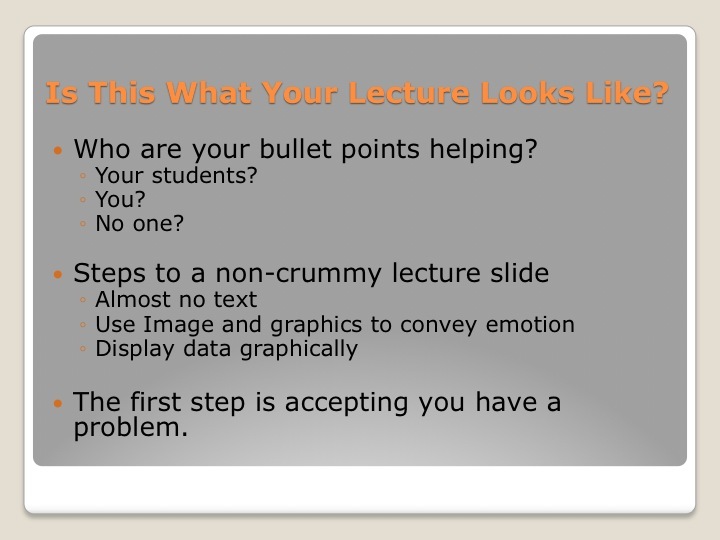 I say so what if your students expect bullet point slides. Give them a well thought out, interesting, challenging class and they won’t complain that you didn’t follow some unwritten rules. I use Google Image search and Flickr’s Creative Commons search to find most of my images. These are free resources that you can use as long as you credit the owner or creator of the images (what’s know as attribution in creative commons lingo). Another option that I use a lot is iStockPhoto.com which is a website that has thousands of professional royalty free images for around $5 each. This is less attractive, but if you buy images that can be reused in many classes it can lesson the pain.
. You owe it to yourself to read this book. Lastly, I don’t use PowerPoint because I find that program infuriating. If you have a Mac you should at least try Keynote. It makes it dead simple to produce snazzy lecture slides in less time than it takes to fumble through PowerPoint.